I'm rubbish at scrabble, so much so I hate it. It’s a game that relies on the player having a dictionary downloaded into their brain and be able to play the board. While everyone else is playing a triple word scored 'quantize' I'm adding a couple of letters to make 'pet'. The game of Qwirkle is different. You can feel the scrabble hereditary, but rather than literacy skills Qwirkle uses colours and shapes. Instead of adding letters together to make a word you're placing tiles down in a pattern to try and score the most points. You can't just point them anywhere; no you can’t play two tiles of the same colour or same shape in the same row. Points are scored based on how many rows you add your tiles to. 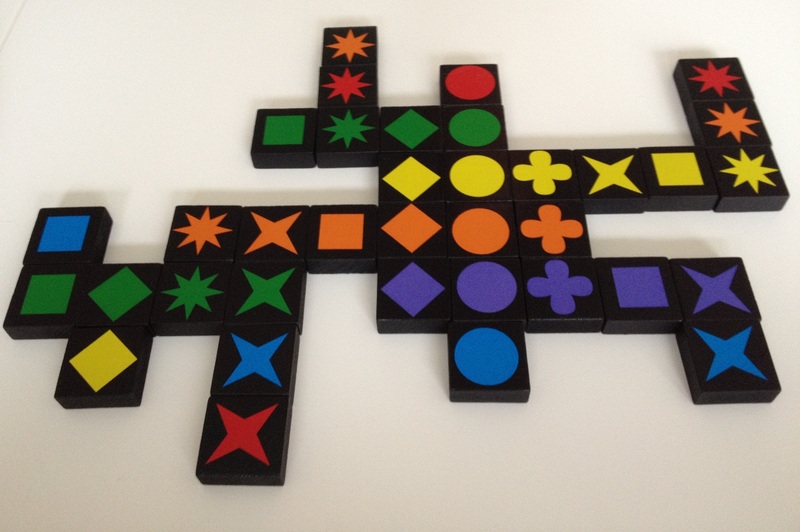 If you manage to get all 6 different coloured tiles of the same shape in a row, or all six of the same colour you score a Qwirkle for double points. Not one, not two but three qwirkles in action! Qwirkle is a simple game that relies on a little luck and a little pattern recognition to work well. It’s also a quick game, typically about 30 minutes which means that you'll easily be able to fit a couple of games in. It’s not a dice heavy sword bash, it’s not a deep and strategic cube shuffler, what it is is a light yet cerebral affair. It may seem overly simple at first and that just means you’ll pick up the game instantly but as you delve deeper you realise there’s an underlying level of strategy. The first area where you are going to need your wits is in spotting the places for the best scores. Having the right tile in your hand is just half the challenge; playing it in the right place to maximise your points is where the real skill often lies. There’s nothing worse than playing a tile only to realise that a gut busting score was just staring you in the face. The second skill is knowing when to place your tiles. Within the game are only three of each tile, which means choosing when to play a tile starts to become an interesting decision. Do you hold on to that orange circle knowing that you only need a blue circle to get that illustrious qwirkle or do you play that red star in a corner position meaning you get a haul of points but leaving it open for some other lucky player to place their tile and get even more points. The third option is to be that selfish git who places their tiles in such a way as to block any future qwirkles. It’s these decisions that turn a deceptively simple game into a more strategic affair. You are still at the mercy of the randomness of a blind tile draw but these choices make the game more interesting than it first seems. 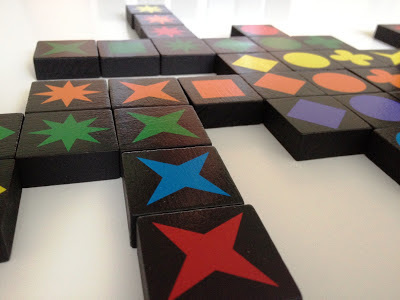 I started by comparing Qwirkle to scrabble but really it is game that takes elements of scrabble, dominoes and those addictive gem matching videogames. One thing to note, quite literally, is this is one of those games where you’re going to need to keep a tally of the sores as you play, so keep some paper and a pen handy or one of those nifty score keeping apps for your fancy phones (Scorekeeper XL is my favourite). Qwirkle is a fun little family game. Its simplicity means it’s a doddle to pick up but there’s an underlying level of strategy that elevates the game to something much more interesting than it first appears.